3 search results for "Noether boys"
Next year I’ll be teaching a master course on the “History of Mathematics” for the first time, so I’m brainstorming a bit on how to approach such a course and I would really appreciate your input. what are relevant questions for historians of mathematics to ask? how do they go about answering these questions? having answers, how do they communicate their finds to the general public? To make this as concrete as possible I think it is best to concentrate on a specific period which is interesting both from a mathematical as well as an historic perspective. 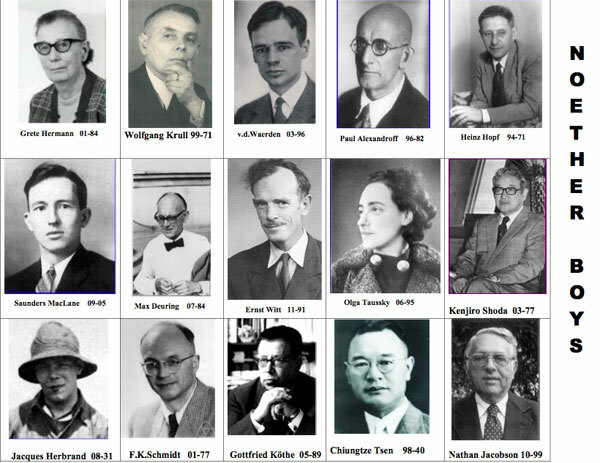 Such as the 1930’s with the decline of the Noether boys (pictures below) and the emergence of the Bourbaki group, illustrating the shift in mathematical influence from Germany to France. The Bourbaki bibliography compiled by Liliane Beaulieu. It lists nearly all articles and books written about the Bourbaki group, several available online. 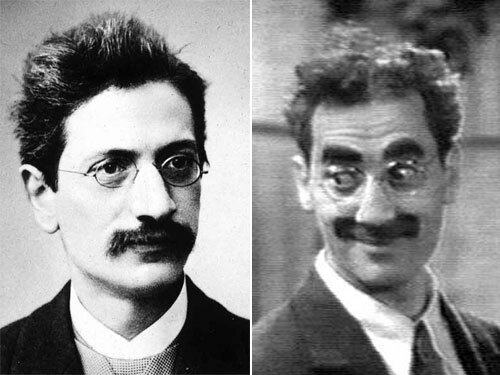 Many of the first generation Bourbakis spend some time studying in Germany in the late 20ties early 30ties. To what extend did these experiences influence the creation and working of the Bourbaki group? Now really, did Witt discover the Leech lattice or not? What if fascism would not have broken up the Noether group, would this have led to a proof of the Riemann hypothesis by the Noether-Bourbakis (Witt, Teichmuller, Chevalley, Weil) in the early 40ties? I hope students will come up with other interesting questions, do some excellent detective work and report on their results (for example in a blogpost or a YouTube clip). In April my Google+ account will disappear. Here I collect some G+ posts, in chronological order, having a common theme. Today, math-history (jokes and puns included). 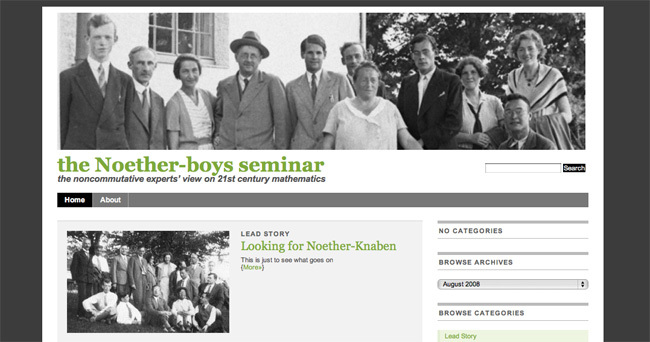 (Noether-Knaben in German) were the group of (then) young algebra students around Emmy Noether in the early 1930’s. Actually two of them were girls (Grete Hermann and Olga Taussky). The picture is taken from a talk Peter Roquette gave in Heidelberg. Slides of this talk are now available from his website. In 1931 Jacques Herbrand (one of the ‘Noether boys’) fell to his death while mountain-climbing in the Massif des Écrins (France). He was just 23, but already considered one of the greatest minds of his generation. “Jacques Herbrand would have hated Bourbaki” said French mathematician Claude Chevalley quoted in Michèle Chouchan “Nicolas Bourbaki Faits et légendes” Edition du choix, 1995. («Jacques Herbrand aurait détesté Bourbaki» in the original French version). Can anyone tell me the underlying story? I’d better point them to the latest on this then. +Pieter Belmans (re)discovered a proto-drawing of Mumford’s iconic map of Spec(Z[x]) in his ‘red book’. The proto-pic is taken from Mumford’s ‘Lectures on curves on an algebraic surface’ p.28 and tries to depict the integral projective line. The set-up is rather classical (focussing on points of different codimension) whereas the red-book picture is more daring and has been an inspiration for generations of arithmetical geometers. Still there’s the issue of dating these maps. Mumford himself dates the P^1 drawing 1964 (although the publication date is 66) and the red-book as 1967. Though I’d love to hear more precise dates, I’m convinced they are about right. In the ‘Curves’-book’s preface Mumford apologises to ‘any reader who, hoping that he would find here in these 60 odd pages an easy and concise introduction to schemes, instead becomes hopelessly lost in a maze of unproven assertions and undeveloped suggestions.’ and he stresses by underlining ‘From lecture 12 on, we have proven everything that we need’. So, clearly the RedBook was written later, and as he has written in-between his master-piece GIT i’d say Mumford’s own dating is about right. “I was a graduate student taking the course Mumford gave on curves and surfaces; but algebraic geometry was not my main field, and soon into the course I was completely lost. 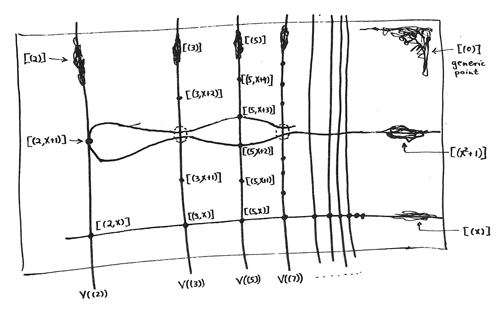 Then Mumford started a self-contained topic that he was going to weave in — ring schemes — and it made clear and beautiful sense to me; and when he constructed the Witt vector ring scheme, I thought about it, saw a nicer way to do it, talked with him about it and with his permission presented it to the class, and eventually wrote it up as a chapter in his course notes. which sounds very Bergmannian to me. Anyway I’d love to know more about the dating of the ‘Curves’ book and (even more) the first year Mumford delivered his Red-Book-Lectures (my guess 1965-66). Thanks. 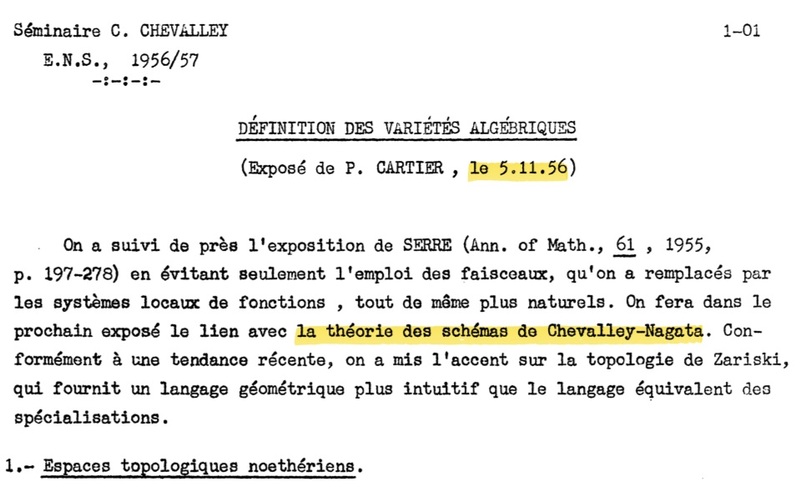 In the 1956/57 Chevalley seminar Cartier gave the first two talks and in the first one, on november 5th 1956, one finds the first published use of the word ‘scheme’, which he refers to as ‘schemes in the sense of Chevalley-Nagata’. 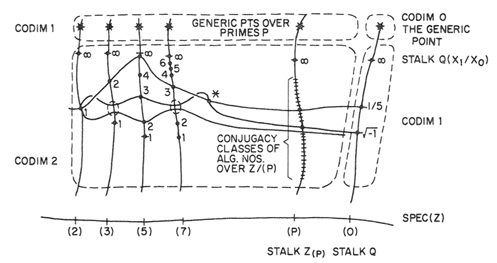 On page 9 of that talk he introduces the prime spectrum with its Zariski topology. In the second talk a week later, on november 12th, he then gives the general definition of a scheme (as we know it, by gluing together affine schemes and including the stalks). Grothendieck then made the quantum-leap to general commutative rings. 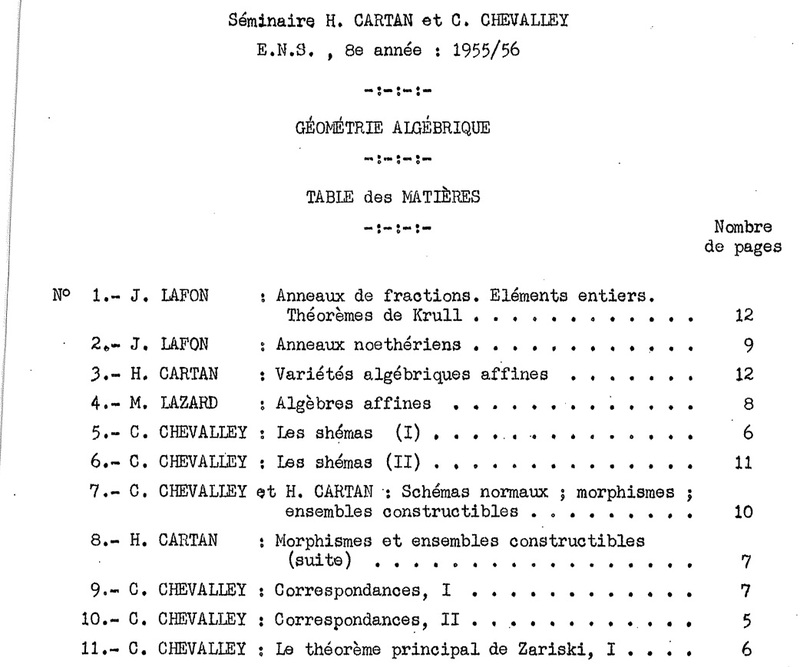 Claude Chevalley gave already two talks on ‘Schemes’ in the Cartan-Chevalley seminar of 1955/56, the first one on december 12th 1955, the other a week later. 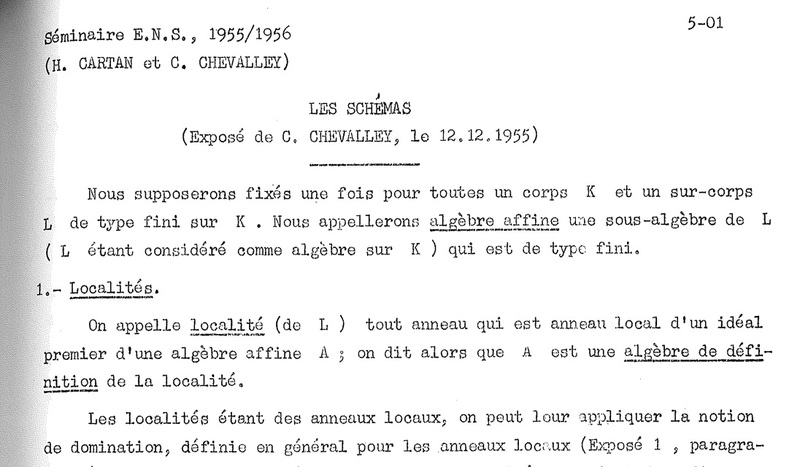 Chevalley only considers integral schemes, of finite type over a field (Cartier drops the integrality condition on november 5th 1956, a bit later Grothendieck will drop all restrictions). “The best known case is the Italian school of algebraic geometry, which produced extremely good and deep results for some 50 years, but then went to pieces. There are 3 key names here — Castelnuovo, Enriques and Severi. C was earliest and was totally rigorous, a splendid mathematician. E came next and, as far as I know, never published anything that was false, though he openly acknowledged that some of his proofs didn’t cover every possible case (there were often special highly singular cases which later turned out to be central to understanding a situation). He used to talk about posing “critical doubts”. He had his own standards and was happy to reexamine a “proof” and make it more nearly complete. Unfortunately Severi, the last in the line, a fascist with a dictatorial temperament, really killed the whole school because, although he started off with brilliant and correct discoveries, later published books full of garbage (this was in the 30’s and 40’s). The rest of the world was uncertain what had been proven and what not. He gave a keynote speech at the first Int Congress after the war in 1950, but his mistakes were becoming clearer and clearer. After more than 70 years, credit is finally given to a fine, inspiring and courageous Basque algebraic geometer. One of the better held secrets, known only to the first generation Bourbakistas, was released to the general public in april 2012 at the WAGS Spring 2012, the Western Algebraic Geometry Symposium, held at the University of Washington. 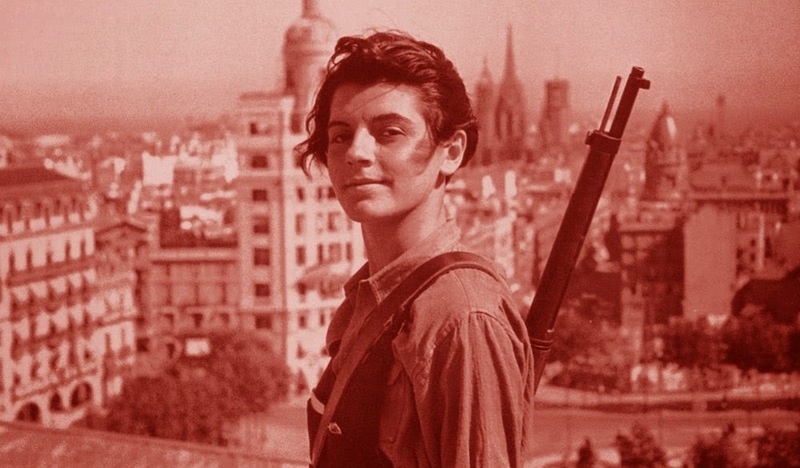 Hirune Mendebaldeko was a Basque pacifist, a contemporary of Nicholas Bourbaki, whom she met in Paris while there studying algebraic geometry. They were rumored to be carrying on a secret affair, with not infrequent trysts in the Pyrenees. Whenever they appeared together in public, however, there was no indication of any personal relationship. The explanation at the end of +lieven lebruyn’s blog post was indeed the original motivation for the name. 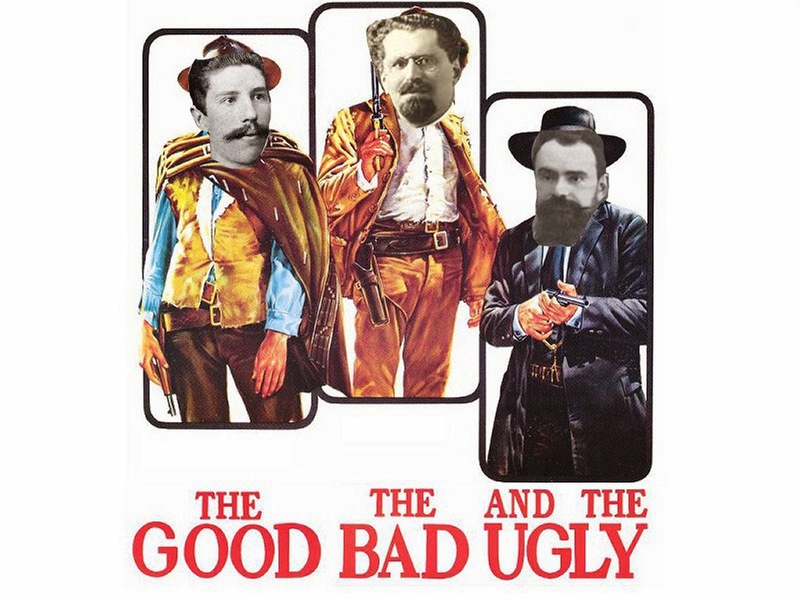 We were starting a new “named” lecture series as part of WAGS and wanted to name it after someone not obvious. Basque is a language not related to any other. It seemed a good idea to use that, so very few people would know the meaning of any particular word. This map, from the Rockefeller foundation, gives us the top 3 mathematical institutes in 1927 : Goettingen, Paris and … Rome. 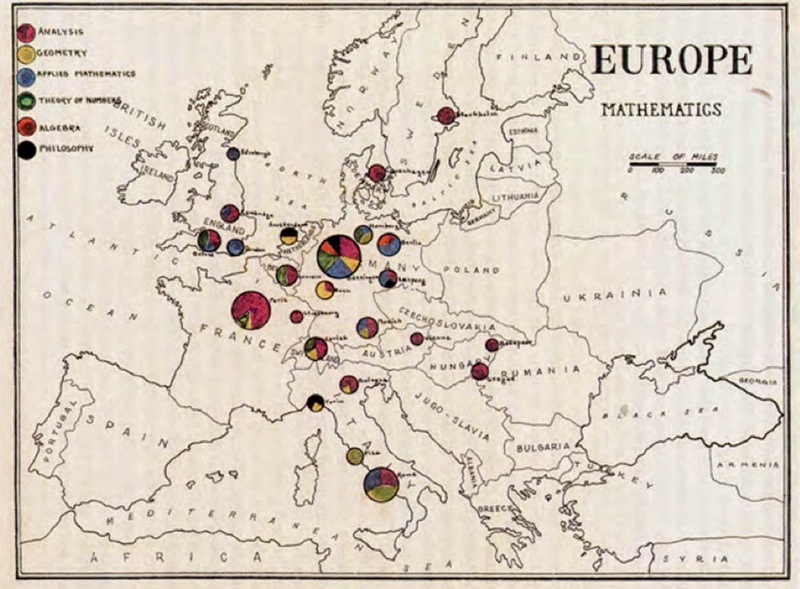 The pie-charts per university show that algebra was a marginal topic then (wondering how a similar map might look today). 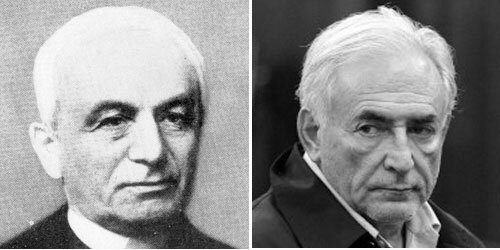 Did Chevalley invent the Zariski topology? Btw. the full lecture of Cartier (mostly on sheaf theory) is not on the IHES YouTube channel, but on the channel of +Laurence Honnorat. here (so far, the wednesday talks are available). The few encounters I’ve had with architects, taught me this basic lesson of life : the main function of several rooms in a house changes every 5 years (due to children and yourself getting older). So, from january 1st 2009, I’ll be moving out of here. I will leave the neverendingbooks-site intact for some time to come, so there is no need for you to start archiving it en masse, yet. Previously I promised to reconsider this blog’s future over a short vacation, but as vacation is looking to be as illusory as the 24-dimensional monster-manifold, I spend my time throwing up ideas into thin and, it seems, extremely virtual air. For reasons I’ve stated before, I can see little future in anything but a conceptual-, group- blog. The first part I can deal with, but for the second I’ll be relying on others. So, all I can do is offer formats hoping that some of you are willing to take the jump and try it out together. Such as in the bloomsday-post where I sketched the BistroMath blog-concept. Perhaps you thought I was just kidding, hoping for people to commit themselves and them calling “Gotcha…”. Believe me, 30 years of doing mathematics have hardwired my brains such that I always genuinely believe in the things I write down at the moment I do (but equally, if someone offers me enough evidence to the contrary, I’ll drop any idea on the spot). I still think the BistroMath-project has the potential of leading to a bestseller but Ive stated I was not going to pursue the idea if not at least 5 people were willing to join and at least 1 publisher showed an interest. Ironically, I got 2 publishers interested but NO contributors… End of that idea. So, what’s the deal? 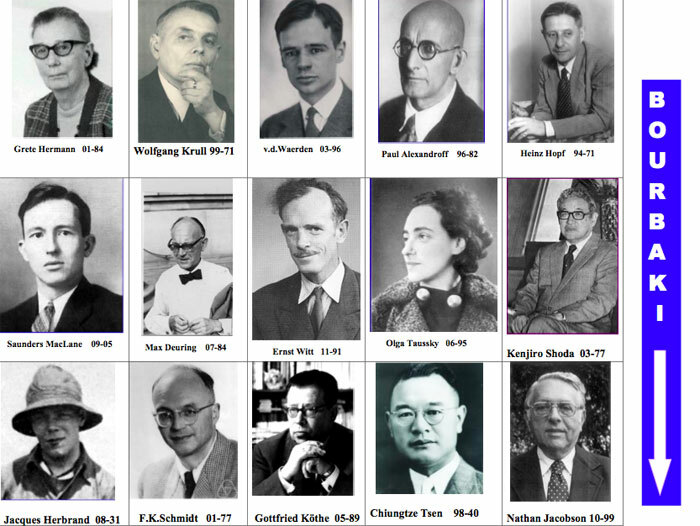 In the 1930-ties Emmy Noether collected around her in Goettingen an exceptionally strong group of students and collaborators (among them : Deuring, Fitting, Levitski, Schilling, Tsen, Weber, Witt, VanderWaerden, Brauer, Artin, Hasse, MacLane, Bernays, Tausky, Alexandrov… to name a few). Collectively, they were know as the “Noether-boys” (or “Noether-Knaben” or “Trabanten” in German) and combined seminar with a hike to the nearby hills or late-night-overs at Emmy’s apartment. (Btw. there’s nothing sexist about Noether-boys. When she had to leave Germany for Bryn Mawr College, she replaced her boys to form a group of Noether-girls, and even in Goettingen there were several women in the crowd). They were the first generation of mathematicians going noncommutative and had to struggle a bit to get their ideas accepted. I’d like to know what they might think about the current state of mathematics in which noncommutativity seems to be generally accepted, even demanded if you want to act fashionable. I’m certain half of the time they would curse intensely, and utter something like ‘steht shon alles bei Frau Noether…’ (as Witt is witnessed to have done at least once), and about half the time they might get genuinely interested, and be willing to try and explain the events leading up to this to their fellow “Trabanten”. Either way, it would provide excellent blog-posts. I’d like to keep Emmy Noether for the admin-role of the blog but all other characters are free at this moment (except I’m hoping that no-one will choose my favourite role, which is probably the least expected of them anyway). So please, if you think this concept might lead to interesting blogging, contact me! If I don’t get any positives in this case either, I might think about yet another concept (or instead may give up entirely).